This week in PlayStation Home, step inside key locations from the Harry Potter stories, Codeglue introduces DIY Racers, RC cars that you can race all over your personal spaces, using furniture to make jumps, bridges and tunnels. Thirteen years after the first book was published, it was announced that J.K. Rowling’s Harry Potter series would be getting its own free interactive online experience built around the books. Pottermore.com opened to all on April 14, 2012, allowing fans across the world to delve deeper into the world of Harry Potter, illuminating the stories with a mix of evocative interactive artwork called ‘Moments’, a range of exciting mini-games and over 20,000 new words from the author herself. As well as housing a dedicated social platform, Pottermore became the exclusive online retailer of the Harry Potter eBooks, which until then had never been available. Check out this morning’s Pottermore post for the full details. DIY Racer by Codeglue turns your apartment into a fun multiplayer race track! Use our specially designed furniture (and your imagination) or your existing items to create jumps, bridges, and tunnels for the most bizarre track you can think of! Invite your friends and race against them on the track that you designed! Choose from 6 cool RC cars (each with their own cool horn sound) and do crazy tricks to unlock the coolest rewards! 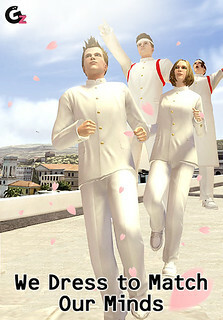 Dressed in white uniforms, a pure, noble feeling enters the heart. Jackets and Trousers are available in 2 types, ordinary student and cheering squad. The lineup also includes shoes and a student cap. Available for both men and women. Everyone can now wear white together. Granzella introduces new patterns for the Embroidered Jacket series. Flashy decorative embroidery on the back of the Embroidered Jacket is compelling. Adding to the existing silver and gold, the new variations include black, pink, red, green, and blue. Available for both men and women, of course. 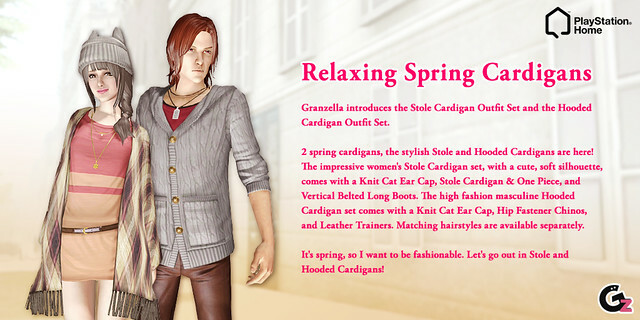 Two spring cardigans, the stylish Stole and Hooded Cardigans are here! The impressive women’s Stole Cardigan set, with a cute, soft silhouette, comes with a Knit Cat Ear Cap, Stole Cardigan & One Piece, and Vertical Belted Long Boots. The high fashion masculine Hooded Cardigan set comes with a Knit Cat Ear Cap, Hip Fastener Chinos, and Leather Trainers. Matching hairstyles are available separately. Hair is good. It keeps your head warm, it can hide unfortunate forehead blemishes or sticky out ears and can add the perfect finishing touch to an outfit with very little effort. But couldn’t hair do more? Couldn’t it be more distracting, more impressive, more… fiery? Lockwood’s flaming hair is exactly that. Hair made of flames. A variety of flammable colors are available now! Eyes are good. Eyes help y… There are flaming eyes too! You’ve danced The Dynamite and you have gestured to your friends. Now get ready for the second volume of animations from nDreams. Motion Captured at the world famous Pinewood Studios there are four new dance packs and two new gesture packs to enjoy including the Retro and Famous Dance Packs and the Love and Rude Gesture Packs. 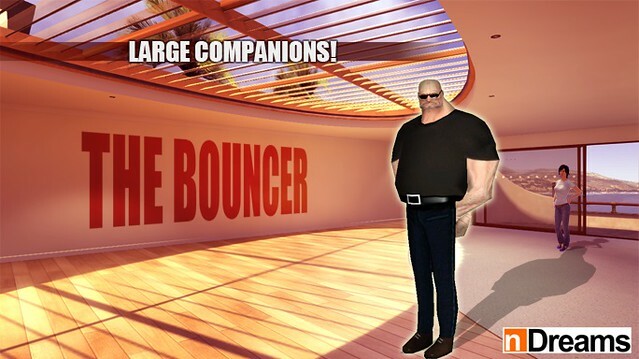 Two very different full size companions will be available this week, The Cursed Companion and the VIP Bodyguard (also known as The Bouncer!) The Cursed Companion will haunt you at every step while the VIP Bodyguard is sworn to protect a very important person – you! This week in exclusive VIP nightclub x7 is a grand one. 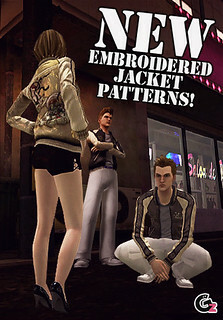 There is a new exclusive value bundle, Konami brings over a dozen new Anime outfits and Moods, VEEMEE launches a ton new, stylish Billabong clothing outfits, not to mention several BMX-inspired locomotions and clothing, and just in time, Lockwood introduces its April Golf clothing collection. Head to x7, take the elevator upstairs, check out these fine items, then dance the night away! Magnus is back again, sharing with us all the hottest new items this week. Check out the video below for all the details. Highlights include Robot Arms from O-Two, a larger than life (and one deader than life) companions from nDreams. Granzella shares new embroidered jackets, school uniforms and cardigans. Also from nDreams, new dance animation packs, not to mention some hilarious gestures (rude for the dudes, love for the ladies). Finally, x7’s exclusive previews include a few bicycle locomotions, from the old timey Penny Farthing to the modern BMX. Enjoy this week’s Virtual Item Showcase. See you in PlayStation Home! Want to chat more about PlayStation Home? Hop on over to the Home Forums! If you’re having trouble with Home, head to the Home Support forum. The Pottermore looks amazing, loving it! Thank you for the great update, I’m wondering will we continue to experience Home for the PS4? Would love Home to continue to blossom. So last week, I get the Doctor Who Tardis…… Then over the weekend on Saturday the new DoctorWho episode introduces the new interior for the Tardis. Any chance on updating that new (already outdated) Tardis? I have been to club X7 twice already. Where is the Lockwood April Golf clothing collection ? So the Pottermore update is “NOT” happening this week? WE have to wait until the 14th? I was really happy to finally explore Diagon Alley and the Hogwart’s Express earlier today. The mini games and trivia are fun, and I ended up picking up some Griffindor clothing. I was hoping there would be some Nimbus-branded broomstick LMO items or wands, so hopefully there are more waves of content planned for future releases. Not to sound rude or anything what is the point on having these anymore when 99% of home users sees what is there before this is even posted I remember right you said back in December that this would only be a few weeks thing if i’m correct. Overall, pretty pleased with this update. The Pottermore spaces were really nice and I loved the free clothing you get when you entered the space. I am hoping to see a Pottermore personal space as well. Hopefully there’s one coming our way..
Loving the new updates in PS HOME :D !! this week i have been on home this is the first time in a long time, and it has improved a lot but more can be done. I went into the store and i found myself spending a lot of unnecessary time in there. I need a way to get in and get out with the things I that I want. maybe you can let us see everything within that one store meaning instead of having to go through all the categories of different places of items I want to be able to see them all in one place. Also I want to be able to sort the items in the store by price I want to see all the items that’s free and cents in the first rows and then the dollars last rows in order. By the way can you tell me something have TVs and the trophy room been canceled or are we still getting them. Aw, man, the usual opening day hang ups! Couldn’t buy anything in Diagon Alley. Sometimes it said error, sometimes a blank band where the price should be. Will try Pottermor space later, but it looks great. I was excited to try out pottermore on the PSHome but I’m having technical issues. When I try to sign into home it says I need an update. I click “ok” and then it says “please wait…” for a few seconds right before the system powers off and reboots itself. Sure. If you are updating from an old version of Home (1.40 or earlier), please wait for the orange “hard drive activity” light to stop flashing on your PS3 before commencing the patching process. I know not everybody gets a reply but i would really appreciate if i get the answer i’m seeking. When will Playstation Home consider having Netflix as a partner or compatible in every EOD Loot Product? That would be up to LOOT and Netflix! That’s a great question and glad they at least took the time to answer it, thumbs up to you. I would love if these post showed screenshots of upcoming personal spaces like the old blogs for home used to.I haven’t bought anything in home for awhile because of this…. I don’t find these “just released” post very exciting and I totally ignore them 98% of the time. Losing sales Sony.. it’s up to you.